Seed of the Early Prize Head lettuce, one of the curled- or loose-leaf varieties, was planted Apr. 10. The rows were 12 inches distant and the plants were thinned so that they were 9 inches apart in the row. Early Growth.--Root development in lettuce takes place rapidly. When conditions for growth are very favorable, lateral branches begin to appear on the first 1 to 1.5 inches of taproot only 6 days after the seed is planted and when the cotyledons alone have unfolded. On May 18, at the first field examination, the plants were 2.1, inches tall, had five fully or nearly fully grown leaves, and a topdiameter of 6 inches. An area of 72 square inches of transpiring surface was found. The pronounced taproots were about 5 millimeters in thickness near the soil surface but gradually tapered to 1 millimeter in diameter. They pursued a course almost vertically downward, with only slight deviations, reaching depths of 20 to 28 inches. The last 6 to 8 inches were slightly thickened and entirely unbranched (Fig. 91). Branches arose in two rows on opposite sides of the taproot. 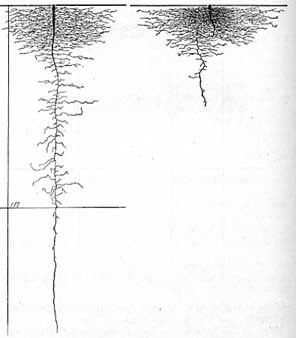 The most profuse branching occurred in the surface foot of soil where 20 to 24 roots originated from a single inch. On an average, 16 roots arose from the second inch and 7 to 14 per inch at greater depths to the 6-inch soil level. On the deeper root, branches were much fewer, short, and unbranched. Although many of the roots in the surface 6 inches ended within 0.2 inch of the taproot, others extended horizontally 4 to 8 inches and a few had a length of 15 to 17 inches. The older ones near the surface were branched to the third order, the ultimate branchlets sometimes reaching a length of 0.5 inch. Below 4 inches the laterals were unbranched. The superficial position of the lateral roots shows clearly the destructive effects that would result even from shallow intertillage. Effect of Soil Structure on Root Development.--Lettuce was grown in a well-aerated soil with an optimum moisture content, placed in large rectangular containers. In one container the soil was only slightly compacted, in the other it was very compact (see Chapter III). A dozen lettuce plants were grown in each container. Three weeks later (Apr. 30) the side was cut from each container and the root system examined. The weather had been clear and the plants had grown rapidly, At this time each of them had four leaves. Plants in the compact soil were slightly the larger. Depths of 17 to 21 inches were attained by the roots in the loose soil; a maximum depth of only 6 inches was found in the dense soil (Fig. 92). In both containers the laterals were about the same length (maximum, 4 inches) just beneath the thin, sand mulch. In the loose soil the taproots pursued an almost vertically downward course and were branched less extensively near the surface but continuously deeper. The taproots in the dense soil were branched more profusely in the surface 4 inches but at greater depths extremely few branches occurred. The main laterals were not only about 25 per cent more numerous, but slightly thicker and more profusely branched. The taproots turned abruptly, apparently having great difficulty in penetrating the compact soil. Fig. 92.--Lettuce seedlings 3 weeks old. The one on the right was grown in compact soil and that on the left in loose soil. Both drawings are to the same scale. Half-grown Plants.--At the time of the second examination, 3 weeks later, June 11, the plants were 8 inches tall. The clusters of 22 to 30 leaves per plant gave the top a total spread of 10 inches. The larger leaves were 5 to 6 inches in length and the width of the leaf was scarcely less. Thus a single plant presented a transpiring area of over 6 square feet. To adequately supply this broad expanse of transpiring tissue with water required a very extensive root system. The taproot had reached a diameter of ½ inch near the soil surface. But it tapered gradually to about 1 millimeter below 8 inches, a diameter maintained almost throughout its course. It deviated from a vertical path, especially in the more compact soil below 2.5 feet, zigzagging and curving laterally through distances of 1 inch or less. Depths of 40 to 45 inches were attained. The last 3 to 5 inches of the taproot and its major branches were free from laterals. The glistening white or creamcolored roots were easily followed; if broken they exuded drops of the characteristic white latex. Owing to drought, many of the most superficial roots had died (cf. Figs. 91 and 93). No branches occurred on the first ½ inch of taproot but small ones were found on the second. These were nearly ½ millimeter thick and extended laterally only 2 to 4 inches. They were poorly rebranched. But the next 3 inches of taproot gave rise to 57 branches of small diameter (1 millimeter or less) and 9 of larger size (1.2 to 2 millimeters thick). Moreover, 18 small and 4 large branches arose from the next 4 inches of taproot. Figure 93 shows the general outward or outward and downward course of these roots. Although many of the finer ones were only 0.5 to 4 inches in length, others spread 12 inches from the taproot before ending or turning downward. The longest ran almost 30 inches before turning and pursuing a vertically downward course. Many of the larger branches reached the general working level of 24 inches. Branching was profuse. For example, one of the larger laterals, originating at a depth of 6 inches, had a total of 102 branches scattered rather regularly over the 20 inches of its horizontal course. These were mostly 0.5 to 1 inch in length, occasionally 2 to 5 inches long, and most had a few secondary branches. Branches were scarcely less abundant, although somewhat shorter, on the vertically descending portions, except on the deepest and youngest part which was unbranched. Fig. 93.--Root system of half-grown lettuce. The plant was 2 months old, 8 inches tall, and had about 25 large leaves. Below 8 to 10 inches the taproots were clothed with relatively short branches (usually 0.2 to 2 inches long) most of which pursued a horizontal course. They were poorly rebranched. These sublaterals seldom occurred in greater abundance than' four to five per inch. In the second to fourth foot the roots followed the crevices of the soil and seldom branched in more than one plane. 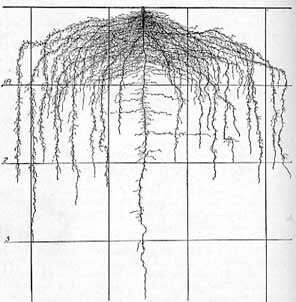 Summarizing, the root habit at this stage of development was characterized by a deep taproot rather poorly branched except in the surface 8 inches of soil and a very large number of widely spreading, well-branched laterals which extended to about 1.5 feet on all sides of the plant and then turned downward and filled the surface 2 feet of soil. Mature Plants.--By July 13 the flower stalks had reached a height of nearly 3 feet and each had 12 to 18 branches. On some of the stalks blossoms had appeared. The base was covered with about two dozen dead leaves but approximately twice this number of green leaves clothed the remaining portion, the column of foliage having a total diameter of 7 to 8 inches. These stem leaves were somewhat smaller than the earlier basal ones, about 4.5 and 5.5 inches in diameter and length, respectively. The total leaf area was 8.4 square feet. The development of the root system during the intervening period of 4 weeks was remarkable (Fig. 94). The taproots had extended their depths from about 3.5 feet to the 6- to 7.5-foot level. As before, however, relatively few long branches originated below the first 10 inches. The large laterals, which formerly had reached a depth of only about 2 feet, now extended well into the fourth foot of soil. Some occupied the fifth foot also, and a few of the longest reached a depthof over 6 feet. That growth was still occurring was shown by the long, unbranched, turgid root ends. The number of branches filling the soil was much greater than formerly and sublaterals were much more abundant. The total spread, however, had not been increased since the preceding examination. Thus a volume of soil, with a surface area of over 9 square feet and a depth of at least 5 feet-nearly 50 cubic feet-was thoroughly ramified by the roots of a single plant. Fig. 94.--Mature root system of lettuce. The plant was excavated on July 13 and had flower stalks nearly 3 feet tall. The taproot was about 1 inch in greatest diameter and maintained a thickness of 2 millimeters even at a depth of 4 feet. Its course, especially in the deeper soil, was quite tortuous. It frequently turned from the vertical for distances of 1 to 2 inches, sometimes pursuing a horizontal direction of growth. Below 10 inches branches occurred at the rate of only three to seven per inch, their distribution being somewhat irregular. Many were short and thread-like; others were thicker and 3 to 12 inches long. Only the longer ones were much branched. Their course was variable, although frequently more or less horizontal. Probably as a result of renewed soil moisture, the surface soil was much better occupied with rootlets than at the June examination. From 250 to over 300 roots usually arose from the first 8 inches of the taproot. Most of these were only ½ millimeter in diameter although 12 to 20 varied from 1 to 4 millimeters in thickness. These large branches ran rather horizontally outward and then downward or obliquely outward and downward before pursuing the somewhat tortuous but generally vertically downward course. Nearly all reached depths of 4 to 6 feet. All of the older roots were light yellow to tan in color but the younger portions were glistening white. Branches from both large and small main laterals were profuse. They occurred at the rate of 4 to 15 per inch and varied from 0.2 to 4 inches in length. The longer ones were furnished with sublaterals, often rather sparsely, few of which were much rebranched. The great network of rootlets will be best appreciated by a close examination of Fig. 94. It should also be kept in mind that the root system was not yet fully mature. Summary.--Lettuce has a taproot which grows very rapidly, sometimes at the rate of 1 inch per day, especially in loose, moist soil. The first laterals are horizontal and very near the soil surface. All of the very numerous, large laterals, which become almost equal in diameter and length to the taproot, originate in the surface 10 inches of soil. Pursuing an outward or outward and downward course, they extend laterally 6 to 18 inches and then turn downward. 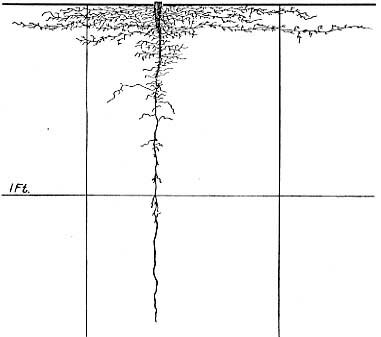 Before the middle of June the wellbranched root system thoroughly occupies the soil to a depth of 2 feet. The taproot extends nearly 2 feet deeper. But below 1 foot branches from the taproot are scarcely longer than those from the major laterals. On maturing plants the roots extend their working level to about 5 feet, and maximum depths of over 6 feet are attained. From just beneath the soil surface to deep into the subsoil networks of fibrous rootlets are abundant. These are densest in the surface foot of soil. Effect of Cultivation on Root and Shoot Development.--To determine the effect of deep tillage upon the growth of lettuce two adjacent plats were sown, Apr. 12, with an uncropped area between them. The five rows in each plat were 40 feet long and 12 inches apart and the plants were thinned to 9 inches distant in the row. One plat was hoed to a depth of 3 inches at five different times between May 21 and July 11 (cf. p. 110). The surface of the other plat and that of the uncropped area were scraped to a depth of ½ inch at the times mentioned. Root examination, June 19, showed that the plants had reached about the same stage of development as shown in Fig. 93. It was found, after careful examination, that many of the large, horizontal, lateral roots in the 1 deeply hoed plat occurred just below the depth to which the soil had been repeatedly disturbed. In the scraped plat the roots were 1 to 1.5 inches nearer the surface. More than a month later, July 28, it was found that, despite the dry summer, the roots came to within 1 inch of the soil surface. Under the mulch of dead leaves, which extended to a distance of 3 to 5 inches radially from the base of the plant, the surface soil was moist and the roots extended to within 0.5 inch or less of the surface. In the deeply hoed plat few or no roots were found in the surface 3 inches except close to the plant where they had been cut. The roots spread only 20 to 24 inches into the uncropped area which was 10 feet wide so that the middle of this, where soil samples were secured, was free from roots. After June 7 it was noticed that the lettuce in the deeply hoed plat was distinctly poorer than that in the scraped one. This condition prevailed throughout the summer, several investigators estimating the difference in favor of the shallow-tilled plat to be about 30 per cent. Difference in growth is in accord with the distribution of the root system in the surface soil, deep cultivation causing considerable disturbance to the shallower portion which occupied the richest part of the soil. Ain examination of Table 18 shows that the lettuce soon lowered the water content of the surface soil beyond that of the uncropped but scraped area. As the roots penetrated deeper differences in moisture content in the deeper soil became pronounced and these finally extended to a depth of 5 feet. At all depths to 4 feet, the deeply hoed soil had a slightly higher water content than the similarly cropped but scraped plat. This may have been due in part to water conservation by the deep surface mulch-the season being quite dry-and in part to the smaller amount of water absorbed by the less vigorous plants in this plat. This experiment, it should be noticed, extended far beyond the time the lettuce crop was marketable. At Ithaca, N. Y., it was found that lettuce responded more to thorough cultivation than to that cultivation made simply to kill the weeds. Although much more study is needed, it would seem that the very extensive root system of lettuce together with its early occupancy of the surface soil would lessen the need for cultivation to maintain a soil mulch for water conservation. Differences in results may be due to variations in root habit in different varieties as well as to differences in soils and climatic conditions under which the plants are grown. Other Investigations on Lettuce.--Lettuce of the Crisp Small. Early Frame variety was washed from the soil at Geneva, N. Y., July 9, when the flower stalks were about 6 inches high. The taproot extended downward to a depth of more than 25 inches. Fibrous roots arose just below. the surface of the soil and ran downward at an angle of about 45 degrees. They were not traced beyond I foot from the taproot. The greater part of the fibrous roots lay within 18 inches of the surface and 6 inches on either side of the taproot. 43 Lettuce roots are delicate and easily broken. It clearly seems that only a small part of the entire root system was uncovered. Certain German investigators conclude that the root system of head lettuce (Lactuca sativa capitata) is much like that of the tomato which was found to occupy a cubic volume of soil about 49 inches in each dimension. Branches of the second order were most numerous (Table 19) and were thought to do most of the absorbing. Relation of Root System to Cultural Practice.--Although the root system of mature lettuce is very deeply penetrating and profusely branched, that of half-grown plants with marketable tops is not very extensive when compared with those of many vegetable crops. Hence, it is important that the soil for lettuce should be moderately deep, well drained, and also retentive of moisture. Muck soils are ideal; they are moist, mellow, and easily worked. On uplands sandy loams are usually preferred. In preparing the soil for lettuce, as for other vegetable crops, it should be plowed deeply. The deeper a soil is loosened the more moisture it will hold. Deep plowing also promotes better soil aeration, increases nitrification and other bacterial activity, and, as shown by experiment, promotes a more rapid penetration of the roots into the deeper soil. A good humus content keeps the soil in good physical condition. One result is better development of roots. Manure is used by nearly all lettuce growers and usually in large quantities. Since the crop grows rapidly, the roots must be able to secure an abundance of nutrients easily, hence a soil of good fertility is essential. Organic matter is beneficial to the soil and to vegetable crops in many ways. It increases the power of the soil to hold water and brings about granulation, which improves both aeration and drainage. The presence of organic matter decreases loss by erosion. Well-rotted organic matter darkens the color of the soil and thus makes it warm earlier in spring. This hastens germination and the early growth of the crop. Finally, it furnishes food materials for the plant. The thorough distribution of the roots throughout the soil mass shows why the common practice of broadcasting the fertilizer is an excellent one. Thorough preparation of the soil before the crop is sown not only insures a better stand but also makes cultivation both easier and more efficient. The frequent shallow intertillage used in lettuce growing has a double value. It not only reduces root injury to a minimum but also conserves moisture since moist soil is not brought to the surface where it would lose its water directly to the air by evaporation. A study of the root systems and of their thorough occupancy of the soil explains why intercropping of cabbage with lettuce, for example, is more likely to be successful where irrigation is practiced than where no provision is made for artificial watering.